The spiny, silvery foliage of cardoon makes a dramatic statement in the garden. 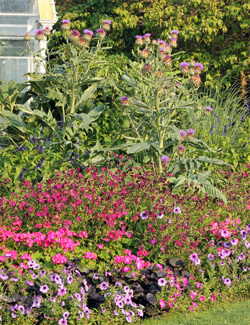 There are many plants that are used as annuals in northern climates, either for their flowers or foliage. Cardoon (Cynara cardunculus), a close relative of artichoke (Cynara scolymus, although some taxonomists have considered them just varieties of the species cardunculus and they will form hybrids), is a great addition to the garden for making a dramatic statement with its large, spiny, silvery foliage and sometimes for the globe-like, violet-topped flowers. This sculptural plant received the Royal Horticultural Society’s Award of Garden Merit. Cardoon has received the Royal Horticultural Societys Award of Garden Merit. It could be considered an ornamental edible as the blanched stems can be eaten, although doing so would ruin the appearance of the plant. Cardoon, with an artichoke-like flavor, was popular in ancient Greek, Roman, and Persian cuisine, and through the medieval and early modern periods in Europe, as well as in colonial America. Cardoon is still cultivated for food in southern Europe and northwestern Africa. This fast-growing herbaceous perennial in the aster family (Asteraceae) is native to the western and central Mediterranean where it was domesticated in ancient times. It is hardy only in zones 7-10, so is treated as an annual in colder climates. In some mild climates, including Argentina, Chile, Australia and California, it has become naturalized and is considered a weed. The first year this perennial forms a large rosette of leaves. The first year the plant produces an enormous single urn-shaped rosette. The leaves start out silver (from the covering of tiny hairs) and eventually become grey-green as they grow up to 3 feet long. The alternate basal leaves have deeply cut, jagged margins with heavy yellow spines along the edges, especially along the petioles. The grey-green leaves are deeply cut with jagged margins and sometimes spines. 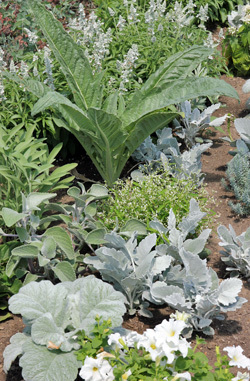 Ornamental and edible cultivars have bright silvery-grey to blue-grey foliage, fewer or smaller spines, and may be larger than the species (up to 5 feet tall). New leaves continue to emerge from the center of the plant throughout the season. Older leaves tend to lie down on the ground, where they can become matted and smother adjacent plants. Plants that successfully survive the winter produce a number of smaller and denser rosettes. Plants don’t always bloom in colder climates as the growing season is not always long enough for this to happen. The large, thistle-like inflorescences are quite ornamental. The violet-purple flowers are produced in a heavily spined capitulum (head) about 2 inches in diameter. Several of the globose inflorescences are produced on each plant. Bees and other pollinators love the flowers. Under the right conditions the plants may self-seed, and become invasive in mild climates. In the second growing season cardoon produces large, thistle-like inflorescences (L and C) with purple flowers (R). 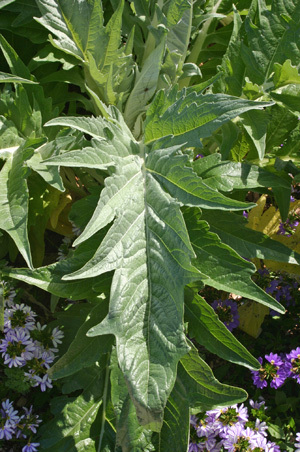 Cardoon offers upright form and bold texture. 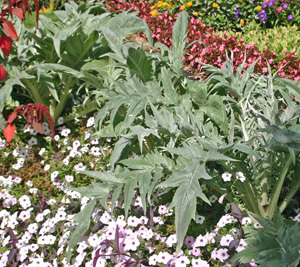 Cardoon offers great textural contrast and can add a Mediterranean look in landscapes. 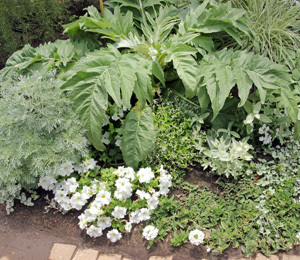 With its somewhat upright form (at least of the new growth) and bold, deeply lobed leaves it is quite different from the mounded habit and medium or fine-textured leaves of many garden plants. 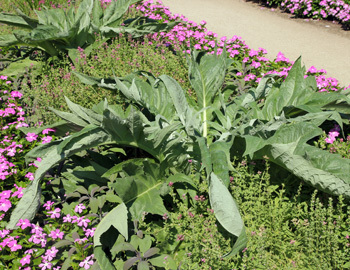 Plant cardoon amid low growing companions as a focal point in annual, mixed, or perennial beds or borders. Combine it with upright grasses such as feather reed grass (Calamagrostis xacutifolia ‘Karl Foerster’) or switchgrass (Panicum virgatum) or surround it with a mass of ‘Profusion’ zinnias. Cardoon combines well with white flowers for a monochromatic look. Choose companion plants that contrast with the blue to silver color of the foliage, or for a color echo, plant dusty miller (Senecio cineraria), lambs ears (Stachys byzantina) or blue Echeveria or choose annuals with blue, purple, rose or burgundy flowers. Red or bronze foliage makes an even more dramatic contrast – some possibilities include Euphorbia dulcis ‘Chameleon’, purple-leaved sweet potato vine (Ipomoea batatas ‘Blackie’ and others), and various varieties of coleus. 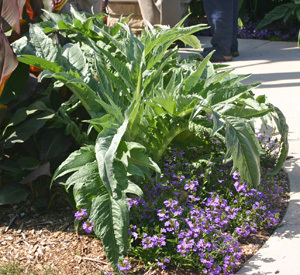 Cardoon can also be grown as a container plant, but that will require a very large container. Cardoon blooming in a Seattle garden. This plant does best in full sun in well-drained soil and preferably protected from strong winds. It also needs plenty of room to spread so may not be appropriate for small spaces. Start from seed indoors 6-8 weeks before the last frost or purchase container-grown plants. Transplant in the garden after the danger of frost is past. 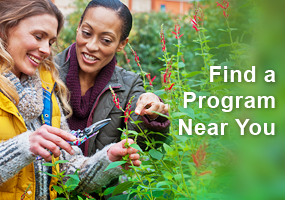 Under ideal conditions the plants will grow 3-4 feet tall and 4-5 feet wide by the end of the growing season, so plan accordingly to allow sufficient space. To maintain a more vase-shaped plant, trim off the older leaves as they flop, either cutting or just snapping them off. When grown as an annual, cardoon has few pests (although in the eastern US there are reports of it being attacked by Japanese beetle) and is not favored by deer. Although this vigorous plant is only hardy to about zone 7, gardeners in colder climates may have success overwintering the plants in mild winters by cutting them back to about a foot tall, covering with soil or compost, and covering that with a bushel basket or rose cone, and then draping the entire thing with a tarp to shed rain. Remove the covering in spring after the snow melts and see if the plant survives. If so, it should bloom that year. Cynara cardunculus var. feroccisima on the island of Lanzarote, Canary Islands (L), the very spiny leaves (LC), flower head before bloom (RC) and in early bloom (R). This prickly variety is not available as an ornamental. I bought a plant 2017 that bloomed in October. I took seeds and got two of them to germinate indoor 2018. Started them in February and transplanted out in May. Both of them started blooming in August. Hopefully I will get even more plants next year, 2019. The bees loves this plant, the blooms are amazing, just as the leaves are great. Might try it with ‘Profusion’ Zinnias. Thanks for a good read. question though. 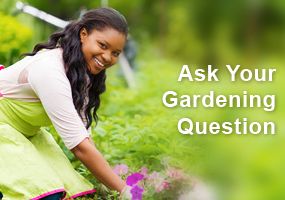 I’m hoping you can answer it for me since you seem to be pretty knowledgeable about gardening. 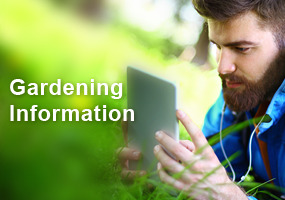 What’s the best herbicide to kill a garden full of various types of plants?